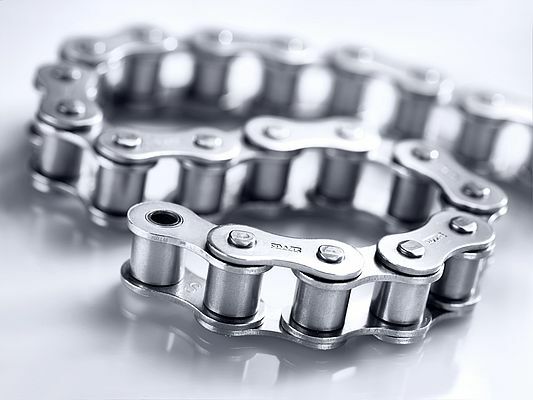 iwis introduces b.dry maintenance-free stainless-steel chains. The corrosion-free chains run completely dry, are extremely wear-resistant and withstand high dynamic loads. They are also maintenance-free and do not need any form of lubrication. These characteristics make them predestined for use in aggressive environments, for applications in which water or steam are applied or where strict cleaning regulations apply, such as the food and pharmaceuticals industries, in cleanrooms and in painting lines. The new b.dry precision chains are the ideal choice wherever relubrication is undesirable or not possible. They are hygienic and run completely dry: Thanks to the high-performance plastic friction bearings in their links, they need no lubrication of any kind, which also eliminates the need for relubrication. Made from a high-performance polymer, the sleeves are heavyduty, low-friction and FDA-compliant. Contact with foodstuffs or hygiene products is safe. The stainless-steel bushes are thin-walled, seamless and ball-drifted. The CF base chain is made from austenitic stainless steel, making it highly resistant to aggressive media. The wear life of the b.dry chains is significantly longer than that of comparable chains: in test runs at iwis, it proved twice better in dry condition and as much as four times better with initial lubrication. In a dry state, the chains are free from paint wetting impairment substances (PWIS), which is important, for example, in painting lines in automobile manufacture. b.dry chains are made in length tolerances compliant with ISO 606. They can be used in a temperature range from -100 to +200 °C. They are also available as roller chains with attachments or extended pins. Custom-developed chains and ANSI chains are also available on request. Munich chain specialist iwis supplies a comprehensive product range for all drives and conveying applications. The full product range comprises precision and high-performance roller chains, conveyor chains, maintenance-free and corrosion-resistant chains, accumulation chains, special purpose conveyor chains, flyer chains, flat-top chains and modular belts for industrial applications, chains and accessories for agricultural machinery, and timing drives for the automotive industry.